Up first are the No. 1 Clemson Tigers from South Carolina facing off against the Oklahoma Sooners. South Carolina is tied for the most mortgage quotes between the four states with 27%, however, they also have the highest average rate over the last year at 3.89; a whole .08 higher than the next highest rate. Luckily though, the state gets a very favorable matchup in Oklahoma, which ranks below South Carolina in three of the four categories. While Oklahoma does have a substantially lower average rate over the last year, it has a lower quote volume, lower FICO, and higher LTV than South Carolina does, which more than covers the ground they had from the advantage in rate. So, with a majority of strong favorable stats across the board, this matchup goes in favor of South Carolina and the Clemson Tigers. Our second matchup puts the Alabama Crimson Tide against the Michigan State Spartans. While Alabama has the lowest amount of quote volume between the four states, it also has the lowest rate at 3.77, a whole .12 lower than South Carolina. The state ranks third in FICO and LTV though, which comparatively make it a much lesser option than it's opponent. Michigan is tied with South Carolina for most quote volume between the four states, and while it’s average rate is slightly higher, it ranks first between the four in FICO and LTV. So while at first glance this matchup may seem close, Michigan runs away with it down the stretch due to its superior FICO and LTV averages. Finally, that leaves us with South Carolina against Michigan for the national title of mortgage data. 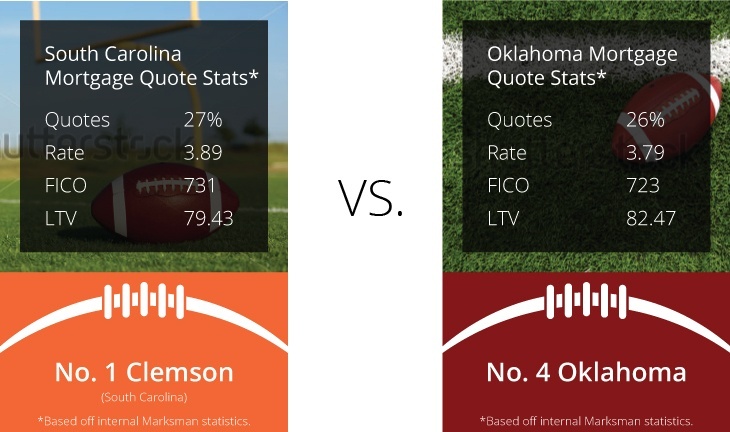 This matchup is the closest by far, with both states having the same amount of quote volume between the two of them. However, South Carolina’s high average rate covers the small gaps between the FICO and LTV scores, both of which Michigan has an edge in. So then, based on this data, it’s clear that if the college football playoff were actually decided on mortgage data, the Michigan State Spartans would be hoisting the trophy on January 11th. 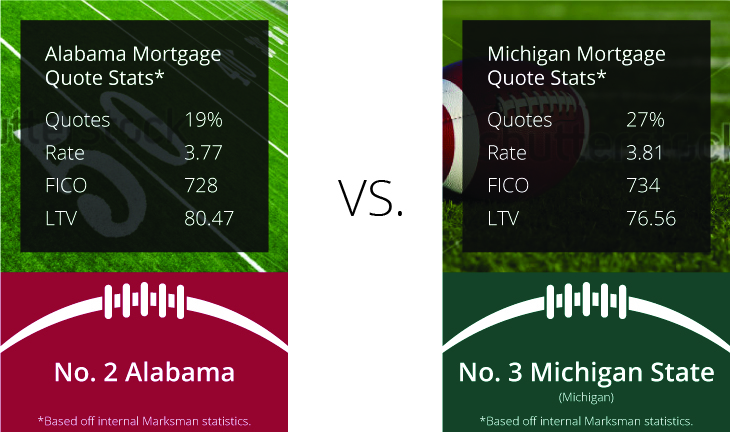 The college football playoff might not actually be decided on mortgage data, but that doesn’t lessen the importance of being able to post accurate rates online quickly to reach more borrowers. Find out today how Mortech can help your business do just that, leading to better lead nurturing, improved internal communication, and ultimately, more closed loans.